So what kind of anime is trinity seven ? Trinity Seven is a fantasy anime. Its a anime with magic, magicians, monsters etc. Its a classic fight between good and evil but its a little diffrent then you might expect. The anime started at October 8, 2014 till December 24, 2014. Its written by Kenji Saitō and molded into a anime by Seven Arcs Pictures. What is the anime about? The anime is about a boy called Arata Kasuga. He is just a normal guy who goes to school everyday and lives with his cousin. We meet our main character Arata Kasuga on the day his life changes forever. As we watch him go to school somethign strange happens. The sun is black somehow. Arata Kasuga thinks that its just himand ignores it at first but then later at school at lunch he is sitting outside. He seems to prefer to lunch at the rooftop and does look up at the sky. Again he does see a black sun. His cousin joins him and Arata asks her about the sun. Somehow she knows about it and says its always been like that. From here it goes fast. A girl named Lilith shows up with a huge gun. SHe turns his life upside down as he remebers what really happened. He remebers that he actually lost his cousin due to a Breakdown Phenomenon. She explains to Arata that he is not in a real world but something he created himself and that his cousin was around to keep the lie a reality until now. The woman asks Arata to hand over his cousinwho seems to be a codex (a artifact that makes a magician stronger and helps its master) or die. Instead Arata chooses a 3rd option. His 3rd option leads him to a school where other magicians live. It turns out that Arata is actually a candidate to become the next demon lord. 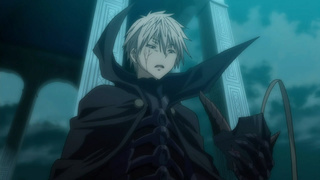 As the demon Lord its his duty to gather the trinity seven and make them his slaves. Everyone of trinity seven is a woman so yes this is your classic fan service anime. The little twist to it is that he does it all on purpose and is not ashamed at all but it more willing to go even further where the usual anime characters would back off and say sorry. 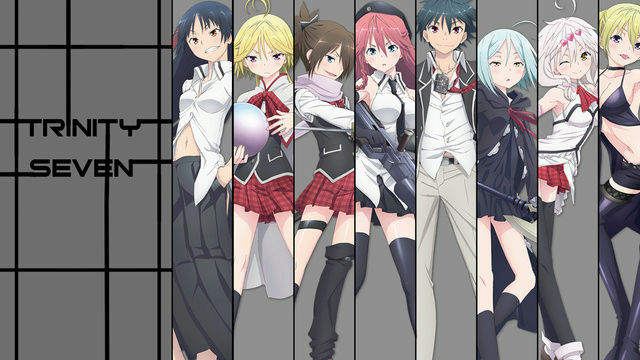 Besides all the fan service is also a enjoyable story line with some decent anime fights and some kind of adventure by finding the trinity seven and his lost cousin. THeir is also a prophecy that totally depends on Arata if he becomes a demon lord and destroys he world. Will Arata be able to prevent himself from joining the dark side? 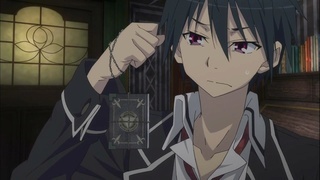 Will he gather all the trinity seven? Will he be able to find his cousin? If you are interested want to know the answer then go watch the anime!! Trinity Seven is a decent anime. Its your daily fan service mixed with fantasy and magicians in one. The story is decent but lacks some plot. The fights are alright but the anime is more about the comedy. The way the humor works is usually when Arata grabs some breasts on accident or on purpose we wont know be he is able to suprise you a couple of times for a good laugh. Its not the best anime around. That is for sure but it is still a decent comedy that is worth to be noticed and watched atleast once if you do enjoy antasy and fan service. I you enjoyed the anime and want to see more then dont worry! Their is a movie of the anime so if you really enjoyed the anime you can also watch that. WHere can you watch this anime? Just the basic sites: Youtube, Kissanime, Gogoanime, Crunchyroll and other anime sites.